The president could sign the measure into law in the coming days, said officials familiar with the issue. The action has set off a vigorous internal debate between White House advisers who favor conciliatory policies toward China and others pushing for tougher trade and security policies toward Beijing. A White House spokesman said he had no announcement on the legislation. President Trump has expressed admiration for Chinese supreme leader Xi Jinping but also has tweeted that he has not been tough enough in challenging China. Trade tensions between the United States and China heightened this week after Trump announced plans to impose tariffs on imports of steel and aluminum products that target China and other trade partners. Legislation passed by both the House and Senate on Feb. 28 calls for the U.S. government to support expanded official visits to and from Taiwan "at all levels." The bill and expected law would be a political slap at pro-China advocates in government who regard Taiwan, an unofficial American ally in Asia for decades, as an impediment to improved relations with China. "Taiwan is a fellow democracy and important partner in the Indo-Pacific region, so I am proud that Congress has now passed the Taiwan Travel Act and is sending it to the president’s desk," said Sen. Marco Rubio (R., Fla.) and a key sponsor of the bill. "It is critical for the United States to strengthen our ties with Taiwan, especially as China increases efforts to isolate Taiwan and block its participation in international organizations," he said. China has blocked Taiwan from joining international organizations and recently began flying both military and commercial flights down the center of the 100-mile wide Taiwan Strait. Taiwan has called the flight a military provocation as it requires Taiwan's air force to scramble jets to intercept the flight that intrude on the island's air defense zone. Coinciding with the provocative Chinese flights, the Pentagon in January authorized the transfer of 250 Stinger anti-aircraft missiles to Taiwan. The travel legislation also follows new U.S. defense and national security strategies that identify China as posing a security threat to the United States. Defense Secretary Jim Mattis has said the shift in strategy was prompted in part by China's militarization of disputed islands in the South China Sea. Currently and under previous administrations, visits to Taiwan by U.S. military and civilian officials were restricted for government and military officials. The limitations were imposed in a bid to avoid upsetting Beijing, despite the fact that U.S. military forces could be called on to defend Taiwan from an attack from China under the terms of the 1979 Taiwan Relations Act. The act was passed by Congress a year after the United States shifted formal diplomatic relations from Taipei to Beijing. The law stipulates continued sales of defensive arms to Taiwan and states that the United States would help Taiwan resist an armed attack from China. The administration currently is limiting official U.S. visits to Taiwan until June, when a ribbon-cutting ceremony will be held for a new building of the American Institute in Taiwan, the unofficial diplomatic representation. The island is the last hold out of Nationalist Chinese forces that fled the mainland during China's civil war in the late 1940s. China regards Taiwan as a breakaway province and has not renounced using force to retake the island. Chinese state-run media threatened conflict if the legislation is signed into law. The Communist Party newspaper Global Times stated in an editorial this week that if the travel legislation becomes law it would trigger one of China's conditions for using force to re-unite the island, an anti-secession regulation. The official Beijing Taiwan Affairs Office issued a more veiled threat stating that the law would violate China's one-China policy. An Fengshan, spokesman for the Taiwan Affairs Office, said Friday China strongly opposes the legislation. "We are firmly against the act," An was quoted as saying by in the official government Xinhua News Agency. "We sternly warn Taiwan not to rely on foreigners to build you up, or it will only draw fire against yourself." China's Foreign Ministry, however, stopped short of threatening force if the travel bill becomes law. Foreign Ministry spokeswoman Hua Chunying would not answer directly when asked about the state media report on the threat of force. The United States should "stop pursuing any official ties with Taiwan or improving its current relations with Taiwan in any substantive way," she said. "It must handle Taiwan-related issues cautiously and properly so as to avoid causing any major disruption or damage to the China-U.S. relations," Hua told reporters. 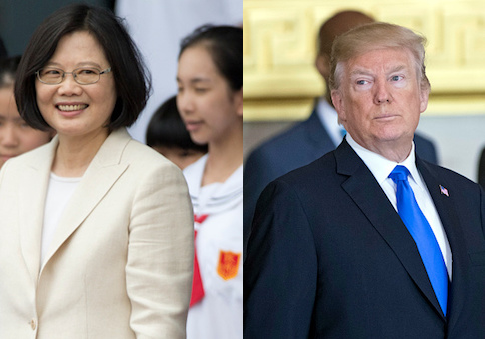 President Trump angered China early last year by accepting a congratulatory call from Taiwan's President Tsai Ing-wen. The president also suggested the United States might abandoned its one-China policy. Trump later backed off the policy change. Several of his key White House advisers are regarded as pro-China advocates, including former Goldman Sachs chairman Gary Cohn, head of the National Economic Council. Those favoring tougher policies toward China include Peter Navarro, a White House adviser in charge of trade and industrial policy. Navarro is one of the key advocates of Trump tougher trade tariff policy shift announced this week. The State Department told the official Taiwan Central News Agency that the travel legislation does not change U.S. policy toward Taiwan. "We consider Taiwan to be a vital partner, a democratic success story, and a force for good in the world. Taiwan shares our values, has earned our respect, and continues to merit our strong support," Michael Cavey, spokesman for State's Bureau of East Asian and Pacific Affairs was quoted as saying. The legislation states that it will be U.S. policy to permit visits to Taiwan by "cabinet-level national security officials, general officers, and other executive branch officials" to meet Taiwanese counterparts. The bill also would allow high-level Taiwan officials to visit the United States "under conditions which demonstrate appropriate respect for the dignity of such officials" to meet U.S. officials including State Department, Pentagon, and other cabinet agencies. Currently, visits to the United States by Taiwan officials, including the president and vice president, are limited to brief "transit" stops on the way to other nations. The last senior visit to the United States took place in 1995 when then-President Lee Tung-hui visited Cornell for a speech. The legislation also calls for allowing the Taipei Economic and Cultural Representative Office, Taiwan's unofficial diplomatic office, to conduct business in the United States and to allow greater activities with Congress and federal and local governments. Global Times, the state-run Chinese news outlet, said Congress' unanimous passage of the bill shows increased national sentiment in the United States in confronting China's growing power. "Bellicosity has peaked in Congress and legislators approved the bill to vent their anxieties about China," the newspaper said. This entry was posted in National Security and tagged China, Donald Trump, Taiwan. Bookmark the permalink.